In 2013 scientists announced a startling discovery: At the bottom of the Pacific Ocean they had discovered a gigantic volcano. This inactive behemoth, which has been quiet for 140 million years, is a thousand miles east of Japan, rises 2 miles up from the ocean floor and has a base about 400 miles wide. Scientists have named the submerged peak Tamu Massif. As massive as this volcano is, however, it is only the second largest one in our solar system. That particular accolade belongs to Olympus Mons on the planet Mars. Its base is similar in size to Tamu Massif's, but it height is much greater: It reaches a staggering 14 miles into the Martian sky from its cliff base on its northeast edge. The land area covered by this monster is an immense 113,998 square miles, about the same size as the state of Arizona. Age: Less than 100 million years. Size: 113,998 square miles (295,254 square km) - about the same as the state of Arizona. One of the first persons to guess that there was something special about this location on Mars was the Italian astronomer Giovanni Virginio Schiaparelli. Schiaparelli spent a lot of time in the second half of the 19th century staring at the red planet through his telescope. He thought he'd observed natural areas on the surface that he referred to as channels. This term was later mistranslated into English as "canals," spurring speculation at the time that they were waterways built by an intelligent Martian population. Eventually better telescopes allowed scientists to reach the conclusion that the channels were just optical illusions . However, one feature that Schiaparelli saw that was later proved to actually exist was a light spot he named Nix Olympica (which means Olympic Snow). Schiaparelli came to the conclusion that this object must be the peak of a humongous mountain as it was one of the few surface features that could still be seen during Mars' frequent dust storms. Nix Olympica kept its name for a century until an unmanned probe launched by NASA went into orbit around the red planet and began taking detailed pictures of the surface. Mariner 9 arrived at Mars on November 14, 1971, in the middle of a huge dust storm. As the clouds subsided, pictures soon revealed that Nix Olympica was not just a big mountain, but a massive volcano that dominated the western hemisphere of the Martian surface. To reflect the mountain's new status, the name was changed from Nix Olympica to Olympus Mons (which means Mount Olympus in Latin). Scientists believe that Olympus Mons is what is known as a shield volcano. Shield volcanos are given that name because they resemble a warrior's shield laid face up on the ground. They are very large with a low, dome-like profile. They are created by a series of lava flows that slowly build up the mountain over an immense period of time. The volcanos of the Hawaiian islands and the newly-discovered Tamu Massif are examples of shield volcanos here on Earth. Shield volcanos differ from the more well- known stratovolcanoes in shape and behavior. A stratovolcano starts with a gentle slope that becomes increasingly steep as you near the peak. Stratovolcanoes often have violent, destructive eruptions that can sometimes blow away large sections of mountain and produce huge amounts of ash. Mount St. Helens in the USA and Mount Vesuvius, Italy,(which famously leveled the ancient Roman city of Pompeii) are examples of stratovolcanoes here on Earth. Shield volcanos rarely erupt explosively. Instead, they repeatedly discharge large lava flows that slowly build up the dome of the mountain. Shield volcanos on Earth often form over "hotspots." These are locations where the heat from deep down in the center of the Earth seems to rise into the crust. Scientists aren't exactly sure what causes a hotspot, but the heat melts the rock to create a magma chamber under the volcano. During an eruption, some of this molten rock is pushed up and out through the volcano's crater to create a lava flow. How do we measure Olympus Mon's height? On Earth, we typically measure the height of a mountain from the peak down to sea level. For example, the top of Mt. Everest is 29,029 feet above sea level (about 5.4 miles or 8.8 km). On Mars, there is no sea to measure from, so this doesn't work. Another way of measuring a mountain, however, is from its top down to its base. If you do this, the tallest mountain on earth is Mauna Kea in Hawaii. It is33,480 feet high (6.3 miles or 10.3 km) but most of it is underwater. Mt. Everest is much smaller with a base to peak height of only 15,300 feet (2.9 miles or 10.2 km). In either case Olympus Mons with a base to peak height of 14 miles dwarfs them both. While shield volcanos on Earth are some of the largest types of volcanos, their size may be limited by plate tectonics. The crust of the Earth is divided into large continental-sized plates that drift and change position over millions of years. Because the hotspot will often stay fixed under the plate, this means that the shield volcano on top will go extinct as the plate carries it away. An example of this action can be seen in the Hawaiian Island chain. Each island was created by a shield volcano. As the Pacific plate moved northwest, it carried the older islands away from the hotspot and their volcanos went extinct. Currently, the hotspot is under the Big Island of Hawaii where the active volcano Mauna Loa sits today. Eventually Mauna Loa will be carried away, become extinct, and a new shield volcano will form over the hotspot. Unlike Earth, however, Mars doesn't have mobile tectonic plates. 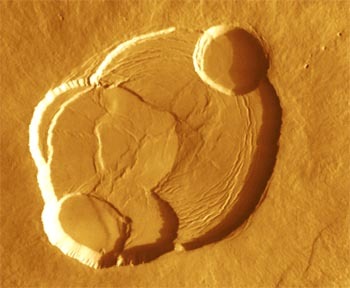 For this reason, Olympus Mons was able to sit over its hotspot for its entire history as it grew larger and larger. Scientists aren't sure how old the mountain is, but the lack of meteor craters on its flanks suggest that it started forming relatively recently, probably less than 100 million years ago. Some of the lava flows look like they might only be a couple of million years old, leading scientists to speculate that the volcano is still active and may erupt again in the future. Examining photos from space probes that scientists have can see at least six collapsed craters (also known as calderas) overlapping each other. Each caldera represents a time in the past when the mountain erupted. When the eruption was over, the magma flowed back out of the underground chamber in the mountain. 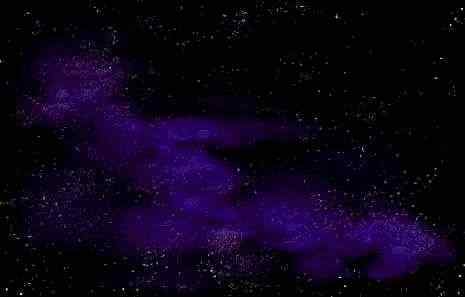 The roof then collapsed on the empty space creating the caldera. If you could visit Mars and stand on the top of the Olympus Mons you would find the calderas spectacular. However, you would have no idea from just looking around you that you were on the top of a huge mountain. Olympus Mons is so large and its slope so gentle (only about 5 degrees) that everything you see around you would be part of the mountain. In the same way, if you were standing next to the mountain you might be able to observe some of the cliffs that make up its edges, but you would be unable to observe the mountain as a whole. The size of the monstrous peak may also just be a product of its location on Mars. 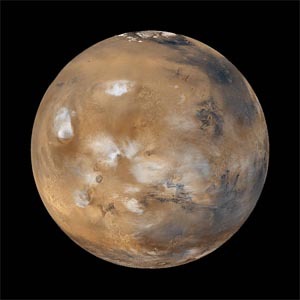 Mars is a smaller planet than Earth with a lower gravity. This may have allowed lava to pile up more quickly than it does on Earth, creating a higher mountain.